Named by Harold Bloom as one of the most significant American novelists of our time, Cormac McCarthy has been honored with the National Book Award and the National Book Critics Circle Award for All the Pretty Horses, the James Tait Black Memorial Prize and the Pulitzer Prize for The Road, and the coveted MacArthur Fellowship. 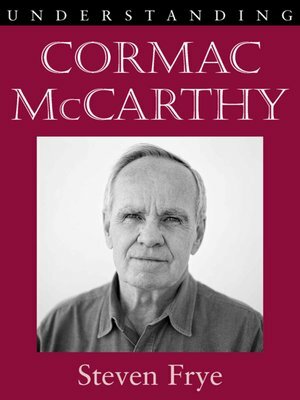 In Understanding Cormac McCarthy Steven Frye offers a comprehensive treatment of McCarthy's fiction to date, dealing with the author's aesthetic and thematic concerns, his philosophical and religious influences, and his participation in Western literary traditions. Frye provides extensive readings of each novel, charting the trajectory of McCarthy's development as a writer who invigorates literary culture both past and present through a blend of participation, influence, and aesthetic transformation. He explores the early works of the Tennessee period in the context of the romance genre, the southern gothic, and the grotesque. A chapter is devoted to Blood Meridian, a novel that marks McCarthy's transition to the West and his full recognition as a major force in American letters. Frye also explores McCarthy's Border Trilogy and his later works—specifically No Country for Old Men and The Road—addressing the manner in which McCarthy's preoccupation with violence and human depravity exists alongside a perpetual search for meaning, purpose, and value.